In his latest book, "Crippled America: How to Make America Great Again", Donald Trump touches on Obama's inefficient approach to deal-making on the golf course. 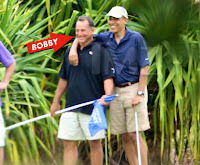 "President Obama is big on playing golf. But he doesn’t play with the right people. . . . Believe me, I know how to use a golf course—and golf clubs—to make deals." So, how does Trump, and other business leaders, use the golf course to further their goals? Golf for Beginners understands that people spend time on the course for different reasons; some just want to enjoy the fresh air and sunshine, some players believe walking the fairways can be therapeutic and others use the sport as an opportunity to gain time away from the trials and tribulations of everyday life. Other folks use golf as a business tool, whether it is to learn more about a prospective business partner, curry favors or to thank employees for a job well done. In this blog, we will present a few tips from deal makers who teach us that golf can be a useful tool for closing deals and building bonds. 1. Networking expert, George Souri, owner of UltraPawn maintains “You should use your time on the course to develop the relationship, not to sell a deal." 2. Looking for a character reference? Play a round with a potential associate. Julian Small, CEO of Wentworth Golf Club states, “When you do business with people, you need to know more about them. Golf rewards players who remain calm under pressure, never lose their temper and think strategically. These are all virtues in business, too." 3. Bill Storer, President of Business Golf Strategies, maintains that focusing on results.."outlining your goals and how you plan to meet them", should be your "pre-shot routine". After reading these strategies, do you think President Obama is using the golf course to his advantage? What is your advice for doing business on the golf course? Voice your opinion on this golf blog and on Twitter @Golf4Beginners. Bluehost is ultimately one of the best web-hosting company with plans for any hosting needs. Claim FREE bitcoins over at Easy Bitcoin. Up to 33 satoshis every 10 minutes.